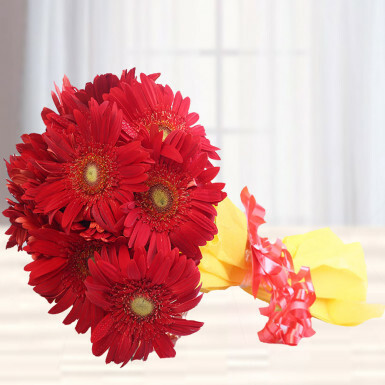 Red gerberas have the power to fill every heart with utmost love, respect and beauty. To express love, occasions are not compulsory, you can showcase your love any day and any time. This bouquet is the perfect choice to express your emotions to your loved ones. 8 red gerberas are wrapped in yellow paper packing and adorned with a ribbon bow. This True Emotion is invented to delight your sweetheart. Have this bunch on occasions like valentine’s day, birthday, promise day, propose day, anniversary and many more. Go ahead and place your order now!